This image was taken in Sudan during the 1993 famine. That's a little girl, crawling slowly and painfully across the ground toward a food distribution center akilometer away, while a vulture watches her and follows, waiting for her to die so it can eat her. 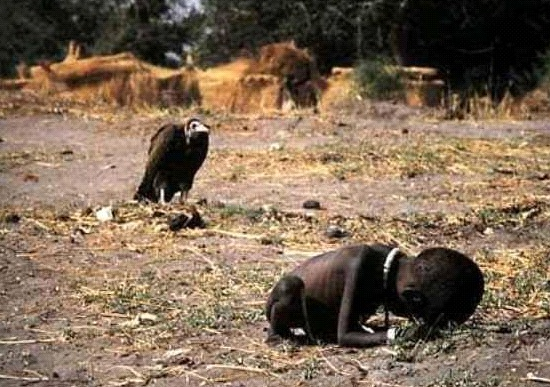 The photographer, Kevin Carter, chased the bird away and then sat sobbing uncontrollably after taking the photo. In April of 1994, Carter was informed he'd be winning the Pulitzer Prize for the photo, and he was presented with the prize on May 23rd of that year. Two months later, he killed himself out of grief and desperation over all of the things he'd seen and his depression at the things humanity does to one another. This image explains something very basic and true about our world, and something we are very reluctant to admit: in order for some of us to have more food than we need, children have to starve to death and animals have to eat them. We purchase our excess with those children's lives. And this photo captured this truth purely and literally for us all to see. It shows the power of photography and the image. Just looking at this makes me feel sad to the pit of my stomach. It motivates change. From the sadness compassion arises. I can only imagine how Kevin felt when he saw this happening in front of him, that's hard for anyone to see.